Lowest prices all the time, guaranteed! If you find a better price, let us know. Taupe Shells quilted bedding by C&F features shells, coral, and starfish in true blue and white scattered on a neutral background. Self binding trim at straight edges. Set a soothing coastal theme no matter how far or near your bedroom is to the coast. Taupe Shells comes in a set with the quilt and sham or shams. Add your choice of accessories to personalize your room. A tailored white pintucked bedskirt is offered. Solid matelasse coordinates are Jacqueline, White Shell, and Colonial Blue. Made from 100% cotton; machine washable in cold water, gentle cycle. Taupe Shells pattern by C & F Enterprises. NOTE: Quilt has straight edges, not scalloped as shown in the photo. The stripe euro shams, stripe bedskirt, and the throw pillows in the photo are no longer available. Taupe Shells Twin 2 Piece Quilt Set has blue and white shells, starfish, coral, and sand dollars on a sandy taupe background. Cotton Filled, Prewashed, Luxury Oversized. Set includes one twin quilt, 64"W x 86"L and one standard sham 20" x 26". Self binding trim at straight edges. Taupe Shells pattern by C & F Enterprises. Manufacturer's UPC code is 008246494492. Note: Quilt has straight edges, not scalloped as shown in the photo. The stripe euro shams, stripe bedskirt, and the throw pillows in the photo are no longer available. Taupe Shells Full Queen 3 Piece Quilt Set has blue and white shells, starfish, coral, and sand dollars on a sandy taupe background. Cotton Filled, Prewashed, Luxury Oversized. Set includes one full queen quilt, 90"W x 92"L and two standard shams 20" x 26". Fits full and queen size mattresses. Self binding trim at straight edges. Taupe Shells pattern by C & F Enterprises. Manufacturer's UPC code is 008246494508. Note: Quilt has straight edges, not scalloped as shown in the photo. The stripe euro shams, stripe bedskirt, and the throw pillows in the photo are no longer available. 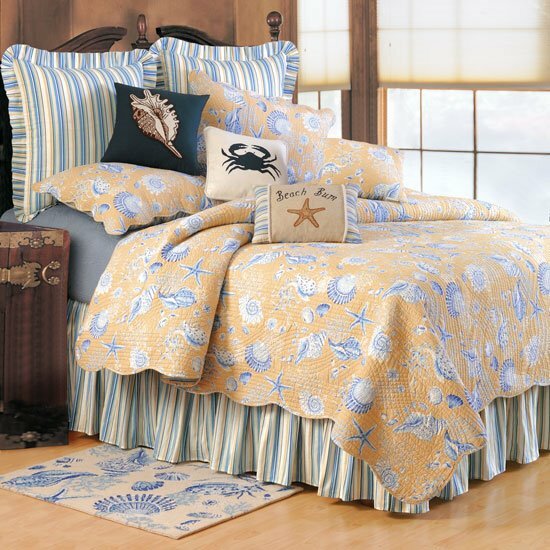 Taupe Shells King 3 Piece Quilt Set has blue and white shells, starfish, coral, and sand dollars on a sandy taupe background. Cotton Filled, Prewashed, Luxury Oversized. Set includes one king quilt, 108"W x 92"L and two Standard shams 20" x 26". Self binding trim at straight edges. Taupe Shells pattern by C & F Enterprises. Manufacturer's UPC code is 008246494515. Note: Quilt has straight edges, not scalloped as shown in the photo. The stripe euro shams, stripe bedskirt, and the throw pillows in the photo are no longer available.